Indian children’s rights activist Kailash Satyarthi earned the 2014 Nobel Peace Prize alongside Malala Yousafzai, a Pakistani activist for female education. Yousafzai is a household name, but who is the Prize’s joint recipient? Meet the advocate and leader who has waged a struggle against child slavery for nearly four decades. Satyarthi first realized that all children are not born with the same opportunities when he was a child himself. On his first day of school, a six-year-old Satyarthi wondered why a boy of his same age was working as a cobbler outside the school gate, instead of joining him in the classroom. The question was imprinted in his mind. His curiosity led him to asking his teacher and headmaster, but they left him with unsatisfactory answers: it is common for poor children to work rather than pursue an education. The social and economic imbalances of his community continued to trouble Satyarthi throughout his childhood. In 1980, Satyarthi made a radical decision to leave his lucrative electrical engineering career behind and devote himself fully to the plight of underprivileged children. Direct intervention, policy advocacy and education access have been the triad of Satyarthi’s efforts ever since. Satyarthi founded one of the largest grassroots movement for the protection of children, Bachpan Bachao Andolan (BBA), or Save the Children Movement, which identifies, liberates, rehabilitates and educates victims of trafficking and slavery. For the past 38 years, BBA has rescued over 82,000 children. Satyarthi is also the architect of the largest civil society campaign for education, the Global Campaign for Education (GCE). GCE has been a driving force in reducing child labor at a global level. The number of out-school-children has dropped by half in the past 15 years. 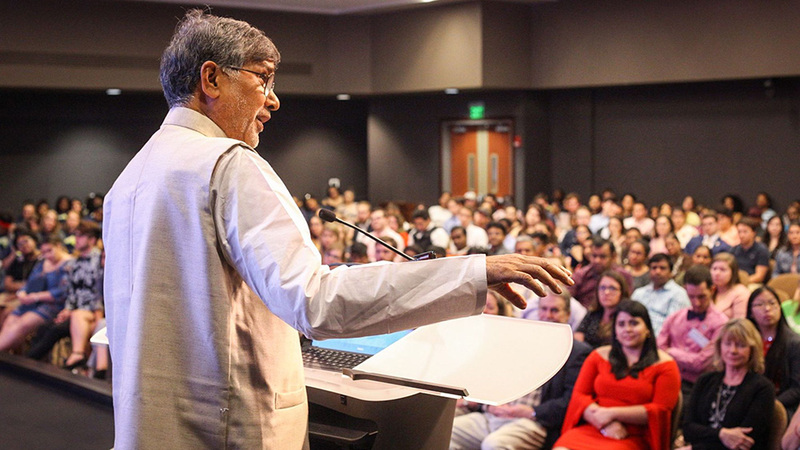 Satyarthi took the stage at Florida State University’s Augustus Turnbull Conference Center as part of PeaceJam Southeast’s Youth Leadership Conference, and spoke at a fitting time: National Child Abuse Prevention Month.